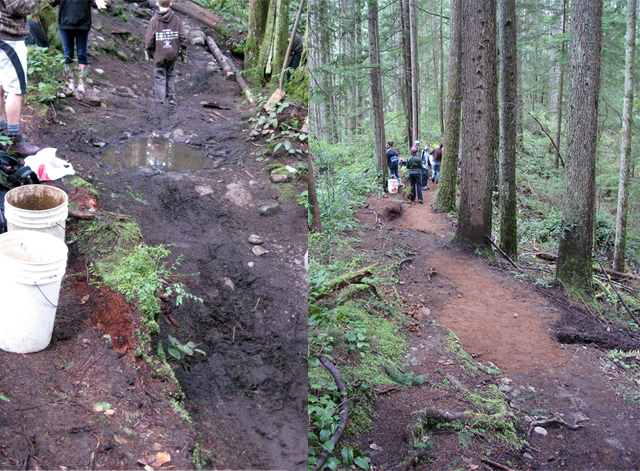 The NSMBA is proud to announce the new Trail Adoption Plan is up and running. “The Eagle is flying,” says Wade Simmons, NSMBA Trail Ambassador. Recent work has begun on Bottletop and Circuit 8, with more trail days coming this month on Pangor, Boogieman, Corkscrew and Dale’s Trail. “Many hands make light work,” says Andrew Handford, owner of Different Bikes as he heaves a pick axe over his head digging for gold to patch eroded holes in the trail bed on Bottletop during the NSRide/Different Bikes work day on April 30th. 12 volunteers heaved buckets of gold under Darryl Marlatt’s guidance to repair the entry traverse by removing soggy sections of organic to be replaced with hard packed mineral dirt. 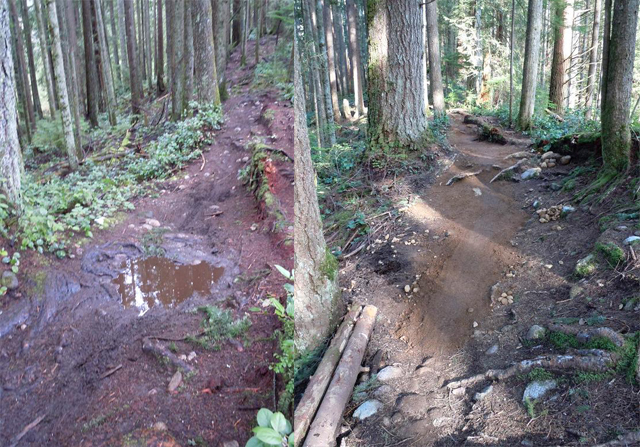 Marlatt is head Trail Maintainer along with Geophysicist Daniel Lui and have worked with Metro Vancouver to establish a work plan to improve the trails’ sustainability. The final touch included crowning and outsloping of the trail bed, two simple, modern building techniques that optimize water dispersion. The resulting improvements ensure future maintenance will be minimized while current flow is maximized. 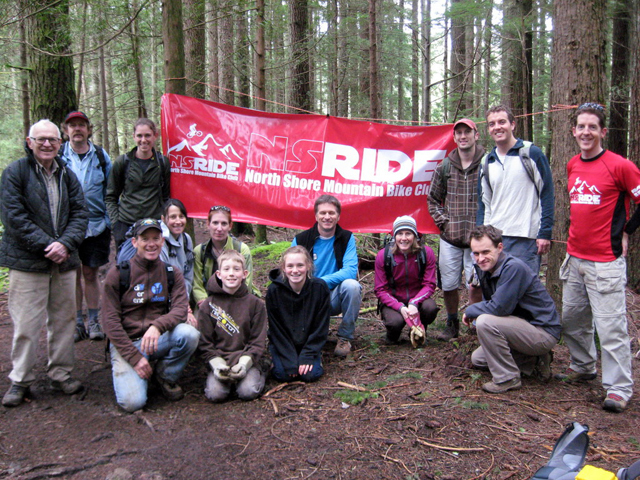 The NSMBA has just purchased $5000 in tools for the task ahead, ensuring every team has the resources to revitalize the trails. 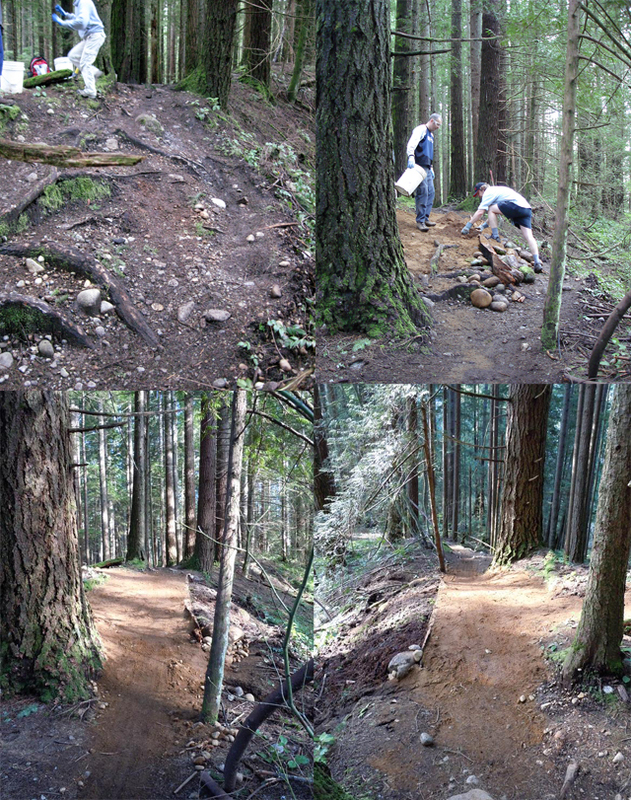 Matt Preston, head Trail Maintainer for Circuit 8 and builder of Sticks & Stones, has been busy with Rocky Mountain Bicycles fixing up one of the few XC trails on the shore, despite the wet weather. “Part of the solution is rerouting unfixable or poorly aligned sections.” Preston will be using a combination of ladder bridging and McLeod work to correct drainage and alignment issues, improving the trail experience for all user groups. Work begins next week on Pangor by the Mudbunnies and Ryder’s Eyewear. “Our goal is not to use any rock armouring,” said Chris Barker, long time Trail Builder who is working with Sven Luebke and a powerhouse workforce of ladies that prove time and again, you’ve got to be tough to wear pink. Jaclyn Delacroix (Aussie Dreamz) has been chief organizer of the efforts of the ladies and it will be exciting to see what this crew is going to do with one of the largest and extremely coalesced work force on this long time favourite and one of the most heavily used routes down the mountain. Many riders await to see what will become of Boogeyman as Sean Gerke and Steed Cycles grab the bull by the horns on one of the most challenging routes on Seymour that needs some significant rebuilding of woodwork as the many stringers and slats have passed their expiry dates. A late entry to the Trail Adoption has been the addition of Giant Bicycles as co adopter, eager to join forces with Steed & Gerke to get ‘er dun! One of the most used entry points from the Mushroom Lot is Corkscrew, a well known trail that epitomizes technical North Shore wood work. Rob Hlus, builder of Natural High and Immonator, whose specialty is technical woodwork, will apply his engineering skills to bolster the existing character of the trail with support from the only non bike entity in TAP, Bank of Montreal, who are a welcome addition as the Adopter of Corkscrew. Stan Yee, Branch Manager at Lonsdale & Esplanade, has been a catalytic force in making this union happen. Having the Bank of Montreal being part of the plan underlines the community connection between the residents of the North Shore, the business community and the people who use the trails. Finally, all eyes will be on SRAM and NSMB.com as they begin work on Dale’s Trail, an old school classic. Digger and Jerry Willows will share the efforts as Trail Maintainers, bringing a wealth of experience to the table, considering Digger was a part of the original effort building the Baden Powell back in the early 70s as a charming little Boy Scout, whom I’m sure had the same twinkle in his eye back then filling his first bucket of gold, and Willows is a long time shore builder who has also starred in many NSX videos. The plans for the trails are now posted. 2011 is a year of revitalization on the Shore as the NSMBA works hand in hand with the Trail Adopters and the District of North Vancouver, Metro Vancouver and BC Parks to improve the trail network utilizing modern, sustainable techniques, while maintaining the original character of the trail. Trails for all, trails forever.